By definition, Internal Organ problems can next be divided into two categories: Shi - Excess or Xu - Deficiency. A simplified example is Blood Pressure. High blood pressure is normally an Excess imbalance, whereas its opposite, low blood pressure tends to fall into the Xu or Deficiency category. Clearly determining in which Organ the problem lies and if it is a Deficient or Excess condition is paramount when utilizing Standing Meditation to address the difficulty. In terms of Zhan Zhuang, as a general rule we could say that for Excess conditions we must reduce or ‘empty out’ what is too much and for Deficient conditions we will augment and reinforce where there is insufficiency or not enough energy. As part of our initial procedure we must now look at what are called the ‘Root’ and ‘Branch.’ This analogy refers to the elements of causation and the manifestations that they present. And this is where things can get a little tricky. Let’s take shortness of breath for example. This, like many of the ‘Branch’ manifestations can have more than one cause or ‘Root.’ Hypertension or High Blood Pressure can cause this effect but so can its opposite, Low Blood Pressure. Of course, this ‘Branch’ can also be caused by Lung or Kidney imbalances as well. So getting to the actual ‘Root’ of the problem in a number of cases may require the help of a Chinese medicine professional. On the other hand, the cause or ‘Root’ of many ‘Branch’ conditions is often quite self-evident. In addition to physical causes, according to the Taoist and Chinese medicine model, non-physical causes can also have a profound effect on the human body. One of the best illustrations of this is our emotions. Certain negative emotions or even beliefs held for a long time can clearly effect the Internal Organs. Severe or prolonged Anger constrains and damages the Liver. Chronic Impatience can restrict the Heart and inevitably the blood vessels. Excessive Worry can weaken the Spleen and trigger a variety of digestive problems. The Lung function can become diminished from deep sadness or grief, resulting in ‘shallow’ breathing. Fear, the most basic of all the negative emotions and the root of all the others, is in the province of the Kidneys. For example, in combat, intense and sudden fear can cause some people, especially those who are not familiar with it to have to involuntarily empty their bladder. Being constantly afraid, like being always afraid of what life presents, can, through the Kidneys, cause a weakening of one’s constitution and shorten their life-span. All that said, once we have determined the ‘Root’ cause and are aware of the ‘Branch’ manifestations, its time to use Zhan Zhuang along with this knowledge and the body’s innate wisdom to begin to improve or correct the imbalance. One of the best methods to start with is the ‘singled-pointed’ focusing of our feeling-awareness and consciousness within the Low Dan Tien and holding it there throughout our entire session to the best of our ability. While this is a well known procedure in Standing Meditation, its power to heal should not be overlooked. By its very nature this method gathers, cultivates and grows our Qi or vital energy and as such, is an excellent starting point for almost all Deficiency conditions - which result from insufficient available energy. The general principle is; as we add to the ‘volume’ of our Qi with this technique, the body, using its own innate wisdom will automatically direct the overflow to the needed area. (s) Repeating this practice daily over several months will usually manifest as an increase in overall energy and/or improvement in the suspect ‘Root’ Organ or body system. While the above procedure is an obvious fit for conditions whose root is Deficiency, it is also the essential starting place for many Excess conditions as well. Let’s say our problem is an Excess type of root or branch symptom in the chest or upper torso. Focusing on the Low Dan Tien by its nature will mobilize and draw downward a certain amount of the Qi from the upper part of the body. For mild conditions, this alone may be enough to relieve feelings of fullness in the chest for example. In Zhan Zhuang, Excess is often ‘drained’ from the congested or blocked areas or Channels, routed through the Low Dan Tien and out the bottoms of the feet into the Earth where the negative or toxic Qi is absorbed and dissipated. But concentrating within the Low Dan Tien has another ability. This is the ability to cleanse our vital energy and even purge unwanted elements. This is often done through heat, like having something on a high boil - cooking the Qi until the impurities are separated or better yet transformed into ‘pure’ healthy energy which is then automatically recirculated as needed. On the non-physical side the ‘single-pointed’ focus method has been shown to help calm and neutralize excessive emotion and even return emotional balance. And equally important, this same method by its very nature, can abrogate aberrated mental states such as negative loops which often can be the cause or at the very least, reinforce negative physical states, stoke downward spirals or create constant deterioration in our body and energy field. Now let’s look at some examples based on the five Yin Organs and how we might go about improving them with Zhan Zhuang. We’ll start with the Lungs and a very common complaint, difficult breathing or Asthma. Although this type of presentation is essentially at its ‘Root’ a Deficiency condition, its ‘Branch’ manifests as an Excess. (Excess phlegm obstructing the breathing passages) Once again, this is the ‘Branch’ symptom, the ‘Root’ cause may be in the relationship between the Kidneys and the Lungs. Chinese medicine calls this problem; ‘Lungs not Grasping Kidney Qi.’ Either way, we begin with the basic method which in itself has the ability to strengthen both Organs, especially the Kidneys. In order to ‘open’ acupuncture points it is necessary to find these locations and dwell there with our feeling-awareness while we breathe in and out, allowing the tissue to expand and condense equilaterally. This can then be repeated for a few minutes or even up to the whole length of a session if we wish. Besides these two points, we can also employ two important Lung points located in each Shoulder’s Nest. These are Zhong Fu LU-1 and Yunmen LU-2 and are naturally activated when we sink and hollow our chest. One generally works with these points in tandem as they are so close together. Later, when we become familiar with the whole process, we can toggle our feeling-awareness between the points on the back and the points in the front. 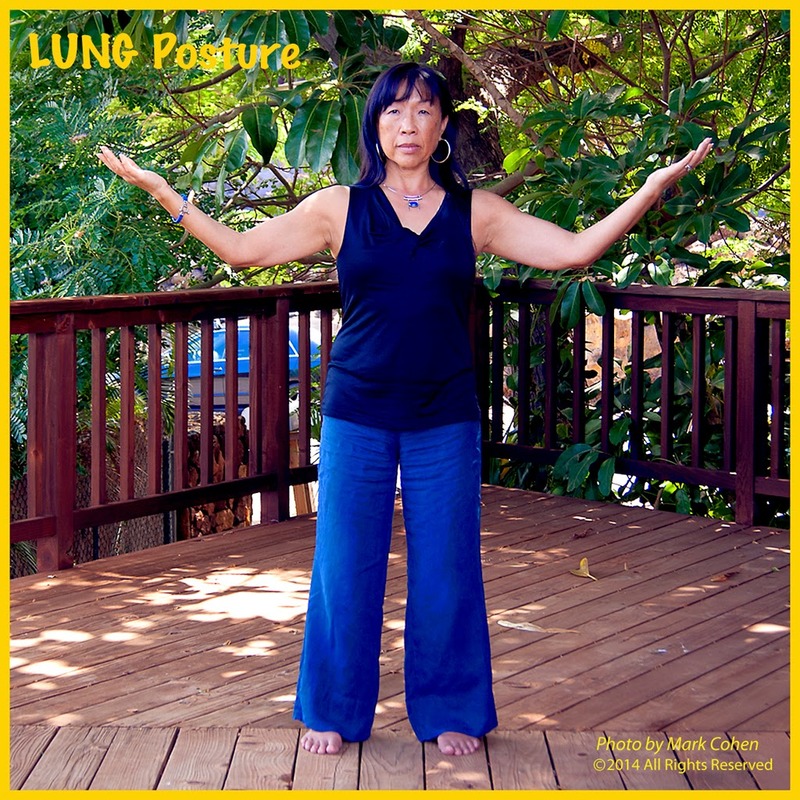 And finally, while in the Wuji posture or later while doing one of the Lung postures, we can run the Qi through the length of the Lung Meridian or Channel to help strengthen the related Organ, clear blockages and vent excess. It is also possible to draw in External Qi to help bolster deficient Channel energy. The advanced version of all this is called Meridian Meditation or ‘Around The World Meditation where one starts with the Lung Channel and then proceeds to move the Qi through all 14 Channels, following a specific sequence. Sometimes the ‘Root’ of an Internal Organ problem is not directly caused by that Organ itself but rather by different Organ. In Zhan Zhuang, when this occurs it is wise to employ the concept of the ‘Mother and Child’ relationship. It is said in Taoism and Chinese Medicine theory that the Organs do not operate in a vacuum, solely independent of everything else, but rather are interconnected and interdependent. In the case of the five Yin Organs, each one is considered to have the role of both ‘Mother’ of another Organ and also ’Child’ of a different Organ. In the case of the Lungs they are the Mother of the Kidneys and the Child of the Spleen. These relationships are arrived at by using the Creation cycle of the 5 Element Theory. It goes something like this; each Organ is assigned a particular Element, for instance, the Liver is considered the Wood Element and wood is necessary to create Fire. The Fire Element is related to the Heart. Therefore, the Heart becomes the ‘Child’ of the Liver. When fire burns down it creates ashes. These signify the Earth Element which is linked to the Spleen. This means, the Heart is also the ‘Mother’ of the Spleen. The cycle continues as follows: As the ashes of fire are absorbed underground, over time they are transformed and form metallic compounds. The Metal Element is the Lung. When these metallic elements have hibernated long enough within the Earth, dampness accrues. This dampness is symbolic of the Water Element which represents the Kidneys. From there the cycle completes itself. In nature Water is necessary for wood to grow. This means that the Kidneys are the ‘Mother’ of the Liver or Wood Element. 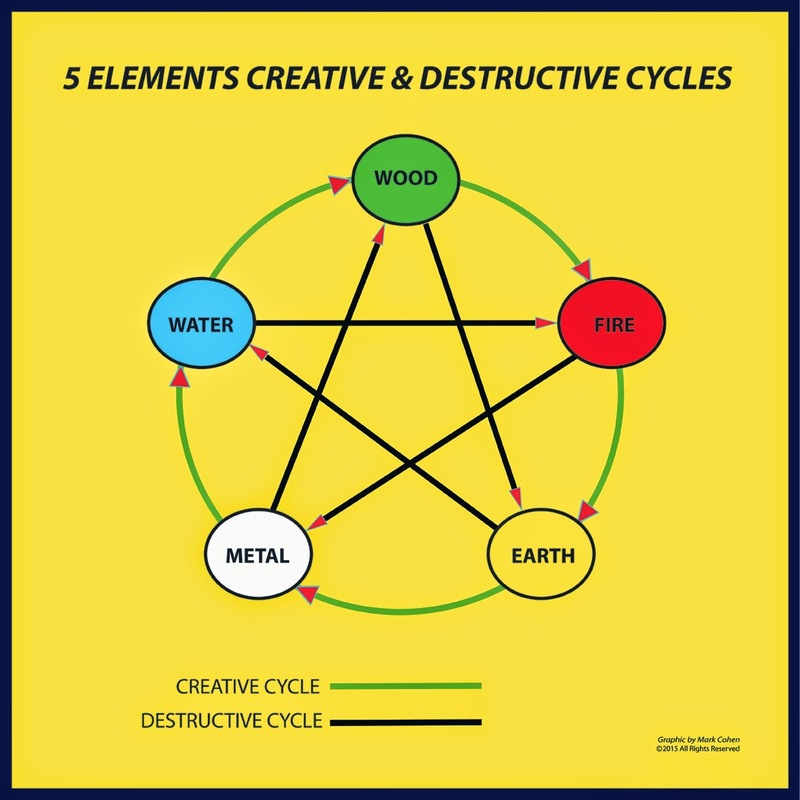 So the ‘Creation’ Cycle of the 5 Elements becomes Wood/Liver -- Fire/Heart -- Earth/Spleen -- Metal/Lung -- Water/Kidneys and then back to Wood etc. The point of all this is to be able to apply the healing techniques discussed with the Lungs and use them in a similar fashion for the Mother of the Lungs - the Spleen, and possibly even the Child of the Lungs - the Kidneys. The reasoning behind this is that in life a mother continually gives to her child, both before birth and afterward. And as a mother uses her own energy to supplement her child, so in this case, the Spleen can be used to nurture, support and benefit its child - the Lungs. Sometimes an Internal Organ problem doesn’t come so much from the particular organ itself as from its ‘Child.’ Children can be needy and a good mother is always willing to help. And it is a well known fact that an overly demanding ‘Child’ can certainly drain the Mother’s energy. In terms of the Lungs this means weak Kidneys can drain Lung energy and set up and contribute to an Asthmatic condition. If all this sounds a bit overwhelming, don’t loose heart. People spend a lifetime studying and contemplating these relationships. For instance, under certain circumstances we may use the so-called ‘Destruction’ Cycle present within the 5 Elements Theory. Yes, there’s also a destructive sequence, as well as one other. Let’s say the problem is High Blood Pressure which is often times a matter of too much Fire in the Upper Burner. Since Water can put out or destroy Fire, in other words control it, we can work with the Kidneys/Water to reduce Heart Fire. It may also be possible using the third of the Five Element sequences to also employ the Metal Element or Lungs to absorb and neutralize Heart Fire. This is based on the idea that Metal has the ability to absorb Heat. In a healthy human body Water and Fire, the Heart and Kidney energies should balance one another. So, when we undertake to solve a problem with any of the other Yin Organs we can apply some of the same methods used with the Lungs, modified when necessary to suit the specific malady. These techniques are: 1) The Basic Method - One-Pointed Concentration in the Low Dan Tien. 2) Diaphragmatic and Meditation Breathing Methods. 3) Opening Specific Organ Channels or Meridian Points in conjunction with the breath or in a purely Nei Gong manner, that is relying on the focus of our feeling-awareness only without any emphasis on the breath. 4) Meridian or Single Channel Meditation - Using the mind and our feeling-awareness to move abundant Qi through a specific Organ Meridian as well as through the actual Organ itself. Lastly, if this sort of deep analysis just simply seems beyond one’s purview, then perhaps a few general principals may prove helpful. When there’s an Excess in the upper part of the body, concentrate on the lower body, Low Dan Tien or feet to draw the excess down and out of the area and empty out the fullness. If the problem’s in the front of the body, try focusing on the ‘mirror’ region on the back. If the difficulty has to do with insufficient energy to properly raise the Qi or Blood, then try focusing at the top of the head which will of itself begin to lift and draw the energy upward. These examples are drawn from the Yin-Yang law of opposites. So, as you can see from these discussions, there are many ways to use Zhan Zhuang Standing Meditation (in conjunction with food/diet, herbs and other modalities) to help improve or downright heal many health conditions, which, in most cases, ordinary people (non-practitioners) have just become resigned to put up with. In the next part we will look at some of the sensations which indicate specific blockages as well as some of the confirmatory signs or sensations which are the effects of correct long-term practice.